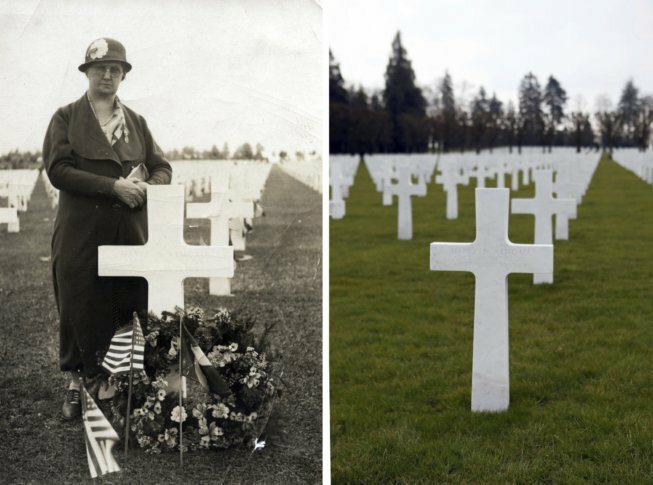 Here is a look at the sites across the former Western Front as the U.S. commemorates fallen soldiers on Memorial Day, and Europe prepares to mark 100 years since the war's end. PARIS (AP) — U.S. troops fighting in France in World War I found a landscape ravaged by trench warfare and chemical weapons, churches gutted by bombs and used as makeshift hospitals, and villages turned into military prisons. A century later, those same verdant fields, rebuilt churches and quaint villages greet American tourists and other world travelers, showing barely a trace of what they endured. The Associated Press has revisited sites across the former Western Front as the U.S. commemorates fallen soldiers on Memorial Day, and Europe prepares to mark 100 years since the war’s end. The AP looked afresh at scenes from 1918 in the Ardennes, Somme, Argonne and Meuse regions, captured in images held in the archives of the U.S. National World War I Museum and Memorial. The Americans arrived late in the war, in 1917, and gave crucial help to Britain, France and other allies fighting Germany. The wartime gloom lifted briefly when U.S. troops marched in a Fourth of July parade in the summer of 1918, through a Paris whose historic buildings and cobblestone streets stand little changed 100 years later. To the north and the east, allied troops were struggling to push back the front line, which had nearly reached the French capital. Near Verdun, U.S. soldiers ran through the main street of Exermont trying to escape German fire, as a comrade-in-arms lay motionless nearby. Today, children ride a toy tractor past the same spot. In a war that claimed some 14 million lives — 5 million civilians and 9 million soldiers, sailors and airmen from 28 countries over four years — and left 21 million wounded, the town church in nearby Neuvilly-en-Argonne became a field hospital for U.S. troops. Bombed out and full of rubble, it was still the sturdiest building in town. Patients lay on the floor in rows, exactly as the reconstructed pews now stand today. Just a week before the Nov. 11, 1918, armistice that ended the war, hundreds of American supply trucks rumbled through a muddy street in Beauclair. Every village here has such a monument, the names of the dead etched in memoriam. American military engineers crisscrossed northern France to rebuild bridges, roads and other essential infrastructure, some of which still stands. Some details are gone, however. The well where German prisoners drew water in Pierrefitte-sur-Aire, watched over by an American soldier, is now covered in pavement. On the day of the armistice, American soldiers celebrated victory with war-weary villagers in Stenay. Today, children run carefree up the church steps where the revelers stood. Of the 2 million Americans who took part in World War I, 116,516 died and about 200,000 others were injured. Many of the dead rest at the Meuse-Argonne American Cemetery and Memorial in Romagne-sous-Montfaucon. It is the largest U.S. cemetery in Europe to this day. This story has been corrected to show that 2 million Americans took part in World War I, not 4.3 million.